When it comes to hard work, using the proper tools and equipment can only make the difference for how long any job will take. A popular phrase is to work smarter, not harder. This is so true, and another good reason to have the right tools at your fingertips. 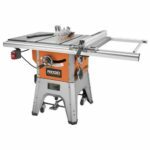 If you are planning a home improvement project, or you are a contractor who needs to keep all your tools handy, then you will want the perfect table saw that comes with compatibility and endurance without breaking the bank. 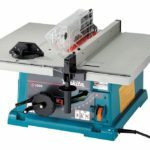 The following list is compiled of five of the best table saws under $1000 that will be the perfect companion to any type of job. 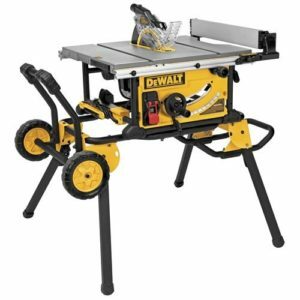 This 10- inch DEWALT table saw is built with a 15 AMP motor that will tear through those 2- inch thick hardwoods in a breeze. For cabinet installers, the 32 ½ inch Rip capacity will cut through heavy shelving, and trim carpenters will have no problem with all those small pieces of wood. This table saw comes with a 2 ½ inch dust collection port that is made to hook into a vacuum for alleviating dust. This saw is easy to assemble, and it includes a 10-inch 24 tooth carbide blade, a rolling stand, a push stick, and a miter gauge. Whether you are working on a hobby, installing a hardwood floor, remodeling the kitchen, or building a deck, this saw will do it all! Complete with an excellent rating at an affordable price, DEWALT delivers a great performance with this saw. 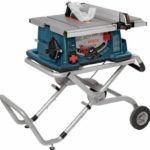 As a portable saw, this would be the best table saw under 1000 dollars. This 10-inch Bosch table saw is convenient enough to carry with you to the job sites. The cutting table will hold pieces that are up to 25- inches in width, and the blade height adjustment wheel will assure they are cut right on the first try. The wheels on the stand are made for easy movement, and it is simple to fold up so that it can be stored when not in use. The riving knife, blade guard, and anti-kickback pawls were added to this saw as extra safety features. This saw comes with a 1- year warranty, a superb rating, and an excellent price! This professional RIDGID table saw is designed for mobility to allow for use in areas with limited space. With the 13 AMP motor, and the 3450 RPM’s, this saw will rip through those thick pieces of wood like a champ. The cast iron table provides a milled and polished surface that helps to minimize the vibration, and at the same time, it will provide you with a flat, level platform for easy cutting. This saw is equipped with a blade guard for added safety, and it comes with the blade, blade guards, a three-wheel base, miter guide, fence, a roving knife, and wrenches for changing the blade. RIDGID offers a lifetime service agreement with this table saw, and a great price! This contractor table saw is built with a 15.0 AMP motor that will cut through a 4×4 in one pass. The blade guard attaches with a cam lock, allowing for simple assembly without ever having to use a tool. For cutting set-ups, this saw features dual side guards that will adjust, permitting easy measurement from the blade to the rip fence. The special design of the guard allows the operator to view the blade as it meets the boards. Other safety features on this handy machine include a riving knife, kickback pawls, a blade cover, an electric brake, and a push stick with its own convenient storage place. The easy extension of this saw makes it the perfect size for handling larger materials, and the adjustable height and lightweight maneuverability make this machine complete. 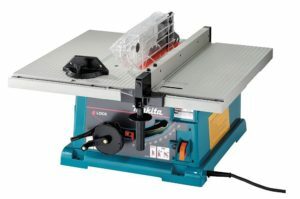 Offered with so many features at a great price, it only makes sense that this table saw would be on this list competing as the best table saw under 1000. This durable 10-inch table saw is built with a 15-amp motor that will give it enough power to get the job done in half the time! 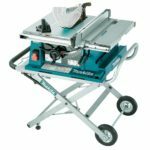 Designed with a PVC base and magnesium table, this machine is lightweight and compatible for any job. An electric brake was added to this saw as an added safety feature, and it offers a cam-locking rip fence. It is designed with a rack-and-pinion bevel adjust, and it will cut through a capacity of 3-9/16- inches. 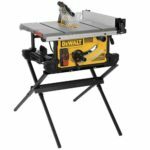 This table saw includes a blade, rip fence, miter gauge, wrenches, an instruction manual, and is complete with a good rating at an affordable price. No matter how big, or how small your job is, these table saws have proven to work well in any situation.